Paintball is a game and sport, in which players compete, in teams or individually, to eliminate opponents by hitting them with pellets containing paint (referred to as a paintball) from a special paintball gun called a paintball marker. 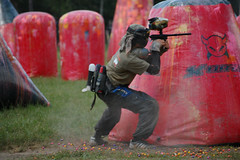 Paintball is great for relieving stress while promoting team work in a fun and interactive atmosphere. Leaders will emerge through practical application of strategic planning. Team spirit and friendships build as the season progresses . The tension and pressure of everyday life is forgotten as the participants slip into their fantasy world.